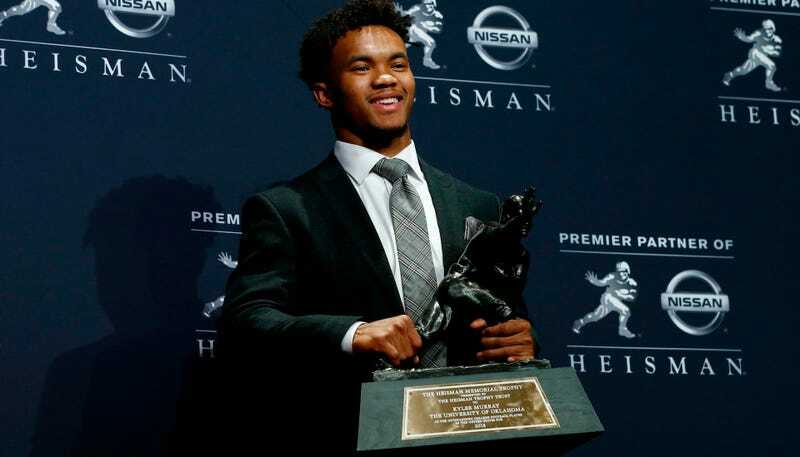 Oklahoma QB and all-around athletic marvel Kyler Murray is a throwback, good enough at football to win the Heisman Trophy and lead his team to the CFB playoff, and good enough at baseball to get selected by the Oakland A’s with the ninth overall pick in the most recent MLB Draft. With that high selection, Murray earned a $4.6 million signing bonus, and he told the A’s upon signing said deal that he’d report to the team after playing out his last year with Oklahoma. That was before Murray absolutely set the college football world on fire this season, racking up a school-record 4,945 total yards, an FBS-record 11.9 yards per pass attempt, and won every major season award. Oklahoma has a date with Alabama in the Playoff, but as Murray’s prepared for that game, questions about his professional future have grown ever louder. It’s become apparent that Murray could have an NFL future as well, and his camp’s stance on the matter has continued to soften. If Murray does declare for the NFL Draft and pursue a career in football, he’d have to repay his signing bonus, though he’d get a large signing bonus if he were picked in the first round anyway. At the start of the month, Murray’s agent Scott Boras said, “Kyler has agreed and the A’s agreed to a baseball contract that gave him permission to play college football through the end of the collegiate season. After that, he is under contract to play baseball. That is not a determination to make. It’s already done.” However, three days later, Boras softened his tone, saying, “When you win the Heisman Trophy, you’re going to have a lot of information come to you and be looked at.” Murray also said he wanted to play both sports in the pros. One day after Boras’s revised comments, Kalyn Kahler of the MMQB reported that not only was Murray considered a likely first-round pick (a pedigree that’s only been helped by Oregon QB and possible top pick Justin Herbert going back to school), a “majority” of NFL scouts who spoke to her believed that Murray would choose football. “They [Oklahoma football staff] were pretty sure that he was going to play football, that he was going to finish this year out and that he was going to be ready for the draft,” one told her. If Murray were the final pick of the first round, he’d receive around $8 million guaranteed, which would make football a wiser short-term decision, though he stands to have a longer playing career if he delivers on his promise as a baseball player. Murray has until Jan. 14 to declare as an early entrant for the NFL Draft. It’s possible Murray could declare but tell teams he plans to play baseball, in which case he could still be drafted in the later rounds. He should obviously pick what’s right for him, and he seems like he’s talented enough to make an honest go at the very highest level of either sport.